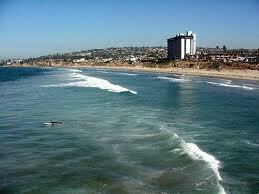 Pacific Beach is one of the popular tourist and residential destinations in all of San Dieg County. Pacific Beach is sourrounded by other great communities such as La Jolla, Mission Beach, Mission Bay and the Pacific Ocean. The closest freeway is Interstate 5, which makes traveling to Downtown San Diego, the Gaslight District, Little Italy, Old Town and the surrounding areas so convenient. Pacific Beach is known for its roller blading, walking, biking, and vacationing on its eight miles of scenic beach and bay view boardwalk areas. These paths afford incredible views of the beach and the bay. On any given day you will find family picnics, people flying kites, playing Frisbee, volleyball or enjoying a barbequed meal. It seems there’s always a party on the beach and/or on the boardwalk, especially during the sunny summer months. When it’s time to take a break from the surf and sand, there are many stores to browse through along Mission Blvd, Grand Avenue and Garnet Avenue. You’ll find many clothing stores, smoke shops, art galleries, craft stores and a variety of eateries, from sit down restaurants, take-out food, bars and pubs. Although this beach town used to be primarily populated with young adults, college students and surfers, over the course of years it’s becoming more popular with older, more professional affluent residents due to the upscale homes in the area. Pacific Beach houses range in price from $200,000 to several million depending on the size and location. Pacific Beach, or “P.B” as the locals call it, is home to one of San Diego's larger nightlife scenes, with dozens of bars, eateries, and clothing stores. Pacific Beach public schools are part of the San Diego Unified School District. They include Mission Bay Senior High School, Pacific Beach Middle School, and several elementary schools. This beach community also serves as a central location for many of San Diego's universities, including University of California, San Diego, University of San Diego, San Diego State University, Point Loma Nazarene University, as well as others. Pacific Beach has so much to offer residents and visitors then simply the beach. It’s a great place to live for everyone, from youngsters to retirees.